Maes-y-Delyn: We have been away... How can you holiday with a smallholding? We have been away... How can you holiday with a smallholding? It's been a few weeks (well probably months) since my last post, but for good reason. We have been overseas; few weeks visiting the motherland (Wales) with our little bear, so she could meet the family (or they could meet her) and spend her second birthday there… yes it’s been 2 years already! So not only have we been away, but the few weeks leading up to our departure we spent time preparing and streamlining as much as possible. I didn't really want to discuss our trip, or more so our absence from the farm publicly (just in case), even though we had someone looking after the place. Taking an extended trip, well even a short trip takes planning and preparation when you have a smallholding. I think anyone who has any animal or plant, could relate. The key is having someone you trust and being organised. This wasn't our first trip since living at Maes-y-Delyn so we knew what to expect. We were lucky to have a young and enthusiastic young man to care take of the place. After all trusting someone with your home, livestock and pets takes a lot of faith, so selecting the right person is crucial. For us this meant not incubating/hatching any chicks. Fortunately the pigs had their litters just in time (so we didn’t need to worry about any other arrivals whilst we were not there). And these were sold before we departed. For me this also meant upgrading my worms from my composter to the eco tank; they would have been happy and this meant one less thing to consider (particularly as they don’t really protest or are visible to remember). We expanded our bee hive by a box; meaning they could expand and not become overcrowded (and hopefully not swarm). And as for the veg patch, the pumpkin vines were left to occupy the one side, with the grower pigs to occupy the other. Fence maintenance is a full time job on larger properties. But even on a small scale they can take regular upkeep. Particularly as we have a number of species close to each other, as well as the house/garden and road and other properties. So checking, tightening and rewiring electric fences are key to peace of mind. By this I mean ease of access for the animals and the caretaker. We generally add additional storage, so this doesn’t have to be done as frequently and ensure the access to water sources is immediate and simple as possible. An extra kiddies paddling pool here and there make excellent drinking and bathing/lounging supplies for dogs and even extra drinking facilities for birds. I can not stress how import water is. Especially in the tropics, as it does get hot and dehydration or overheating will kill livestock and pets. Pigs need access to clean water, as they will wallow to stay cool but will not drink from a wallow or "dirty water". Many people do not realise this and underestimate its importance. We label the feed and leave very straight forward instructions. In the past we have even prefilled and labelled buckets (but only for a short trip). But it is always good to plan ahead. So we had closed off one paddock from the cows (we regularly rotate our stock and manage the grass this way). So this meant they had more than enough whilst we were away. We even did the same for the laying chickens, sectioning off part on the rear garden, this is usually rotated occupation with the dogs (it doesn’t end well when they occupy the garden simultaneously). This way there were no concerns over whether the pens were locked properly etc. We also bought a few hay bales for the pigs, as this not only provides extra grazing but provides them with bedding and entertainment. This is just to minimise workload for the caretaker whilst you are away; and therefore minimise concerns over your animal’s health and wellbeing whilst you are away. But this is obviously dependant on how many animals (or of each type) you have and the circumstance by which you keep them and how long you are away for. Our free range and are therefore not confined to their housing, so bedding etc. can be more than adequate for a few weeks. -Leave clear instructions and contact details. Not that you want to be harasses for every minor thing, but if necessary it’s good to know they can contact you. And a good caretaker will send updates or even photos if you want. But if you are going to be a fair distance away and even in a different time zone (as we were) it is handy to have a list of names (and numbers) upon which your caretaker can seek help or advice if necessary. I even leave notes with the local vet (who know us and our animals well) as to our travel intentions, just in case their services are required. Fortunately there was very little in the way of trouble. The only incident whilst we were away involved one of our sows (fortunately the more docile one) “visiting” the cows on the odd occasion during the last week of our trip. This was most likely due to the weeds that had grown (following some unseasonal rain) between the barb and electric fencing; causing the “belt” to be insignificant… this has since been fixed. 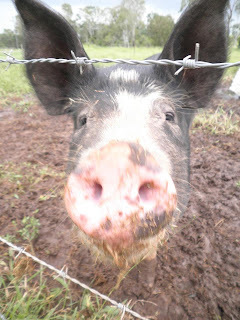 But as for the sow, she was very eager to return to the pig paddock once food was on offer! Even following our caretaker to and from the shed, whilst he got some more for her! That’s one good thing about pigs, they are VERY food orientated! We did lose our sussex rooster, but he had been “off colour” in the days prior to our trip. We possibly should have euthanised him, however he had appeared to improve in the days immediately before our departure. This improvement was short lived. One thing you do learn to accept when smallholding is that somethings are beyond our control and losses are part of this lifestyle (even if we don’t like it). And this would have likely happened had we been there or not. But now we’re back on board it’s getting back to business as usual. 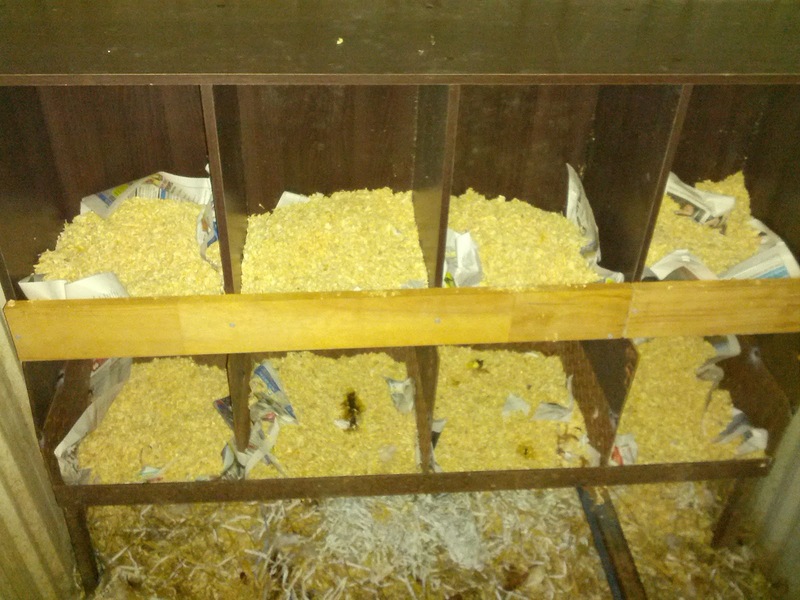 As for our caretaker, I think we had a lasting effect- as he has since bought a few layer chicks for his own future backyard flock and eggs: So success all round!